Finding the perfect wallpaper to match your current mood is not an easy task considering that you must also make sure the image size is suitable for your desktop. uDesktop NEXT is a macOS app designed to provide access to a collection of beautiful wallpapers featuring different sizes. To get started you must indicate a location where uDesktop NEXT can place its library and select the language you want to use for the calendars. Note that you can easily change the language at any time via the main uDesktop NEXT menu. Finding your way around the uDesktop NEXT main window seems easy enough but, if you encounter difficulties, the Help window provides all the info you need. 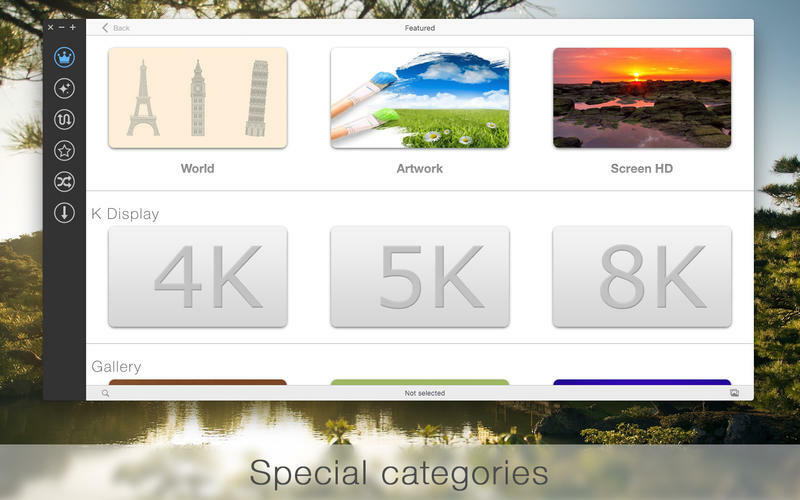 The main area displays the wallpaper’s thumbnails (you can view the actual size on the bottom of each entry), while the left panel allows you to specify the resolution you need and the category you want to browse. uDesktop NEXT provides support for a large number of image resolutions, suitable for various devices: 1280×800, 1280×1024, 1366×768, 1440×900, 1600×1200, 1680×1050, 1920×1080, 1920×1200, 2560×1440, 2560×1600, 2880×1800, Surfboard, 1024×768, 2048×1536, 960×640 and 1136×640. Moreover, uDesktop NEXT comes with over 35 wallpaper categories: 3D, Abstract, Animals, Architectures, Aviation, Birds, Black&White, Calendars, Cars, Cartoons, Cats, Colors, Fantasy, Fire, Flowers, Food, Games, Glass, Holidays, Insects, Interiors, Love, Misc, Monuments, Motorbikes, Mountains, Music, Nature, Ships, Space, Sports, Technical, Textures, Underwater World, Water and Weapons. uDesktop NEXT also allows you to apply different sorting filters: featured, new, recent, popular and random. Once you decided on a wallpaper, double click the thumbnail and uDesktop NEXT will automatically start the download. To actually use the images as your wallpapers you must navigate to the Download panel and drag and drop them on top of the Preview area. You also have the possibility to customize certain wallpaper settings. To conclude, uDesktop NEXT provides quick access to a large collection of high quality images and can greatly reduce the time you spend looking for a new wallpaper, as soon as you learn how to use all its panels.